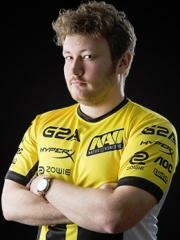 Ioann "Edward" Sukharev is a Ukrainian CS:GO player, formerly a Counter-Strike 1.6 player. At this time, Edward is ranked #100 in highest overall earnings, and #6 in highest earnings for players from Ukraine. Before Edward turned 18 years old, he earned $1,627.36 in cash prizes from 13 tournaments. 0.23% of his total prize money was earned before December 28, 2005. Out of the 203 tournaments awarding cash prizes that Edward had competed in, the largest amount was $50,000.00 from StarSeries & i-League CS:GO Season 7 on April 7, 2019. He placed 1st, making up 7.02% of his total prize money won. Edward obtained $100,000 in total prize money earned on April 7, 2012 with a $1,230.77 cash prize from his 2nd place finish at Copenhagen Games 2012 (Counter-Strike). Prize money from 86 tournaments got him to that point. In the last 90 days, Edward has been awarded $69,000.00 in prize money from 4 tournaments, $53,000.00 (or 76.81%) of which came in the last month.